Vinli's CEO Mark Haidar in a 2007 Toyota Camry. Can any car be turned into a smart car? A Dallas-based startup called Vinli has captured the attention of drivers across the country with a device promising to do just that. We tested it out. The device will live there, in the rectangular connector known as the OBP port. Any car built after 1996 is equipped with an OBD port, and it’s become hot real estate for tech companies trying to revolutionize the driving experience. Vinli, which starts at $99.00, turns your car into a sort of smart phone – where there’s an app store for your car, and an internet connection. Connecting to Netflix from the backseat is nice, but it isn’t the breakthrough technology that helped Vinli raise $6.5 million dollars from companies like Samsung and Cox Automotive this summer. That was for connecting your car to your phone, your home computer and the people around you. Through Vinli’s app store you can download apps to monitor your car’s health, improve fuel efficiency, and even track your teenager, like one called Beagle. “The parent can open it literally from the home and they’ll see this,” Haidar says. Parents can watch the car in real time, even create alerts for speeding. The app e-Call alerts family or friends if you get into an accident. Another app, MileIQ, automatically logs your drives and calculates their value for easy reimbursement. A Future For Plug-In Devices? Once you tap into your car’s brain and connect it to the world outside, the opportunities are endless. Which is why more cars today are being built connected, no device necessary. “Almost any new car you buy today will have some sort of telematics service that they’ll offer with it,” says Wayne Cunningham, who covers car technology for CNET. 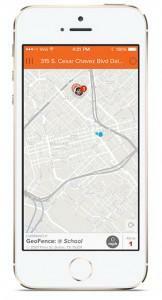 The Beagle app helps parents track driving routes and speeds, and set up custom alerts. Which is why Vinli founder Mark Haider is working on deals with automakers to get Vinli inside cars before they’re driven off the lot. And, he’s hoping to capitalize on interest in something called vehicle to vehicle communication. This Vehicle-2-Vehicle, or V2V technology, could be mandated by the government in the next few years. Then, there’d be even more demand for giving old cars new life, and new brains. High school and college students from across North America will be in Dallas this weekend for what’s being called a hackathon.